Woodstock is a Tree City USA community and works to help take advantage of the benefits of trees. Communities granted Tree City USA membership from the Arbor Day Foundation must meet four requirements. These include an annual Arbor Day Observance and Proclamation, a Tree Care Ordinance, a Tree Board or Department, and Community Forestry Program committed to investing $2 per capita in tree management. Woodstock, GA meets all of these requirements. 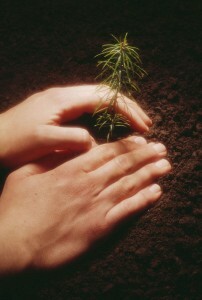 Arbor Day is observed in Georgia on the third Friday of the month. This year, that happens to be Friday, Feb. 20. Part of the annual Arbor Day Observance and Proclamation in Woodstock involves the opportunity for citizens to pick from 800 free seedlings. Woodstock residents are welcome to pick up seedlings between the hours of 8am and 5pm at the Magnolia Hall, City Hall Annex, Dean’s Store, or the Senior Center. Seedling varieties include Red Bud, River Birch, Overcup Oak, Sabal Palm, and Bald Cypress. Booklets containing helpful tips and information regarding tree care, pruning, and watering are available with the seedlings. In addition to giving away 800 seedlings, a tree will be planted to recognize the City of Woodstock employees who are celebrating their 20th year with the city. This year’s Arbor Day tree planting will observe the 20th work anniversary for Police Lieutenant Robert Kline, Administrative Fire Sergeant George Williams, and Crime Analyst Nancy Peterson. Don’t forget to stop by and pick up your free seedlings. Together we can make Woodstock a better place to live with more trees to enjoy!